With floods, hurricanes, tornadoes and earthquakes causing upheaval across the country and triggering huge losses, it can be depressing to visit Facebook these days. We hear about pets left behind by their owners, evacuation shelters that are overloaded with animals and other disheartening stories. But there is also hope and kindness and disaster animal rescue operations. Let’s take a moment to be grateful for all the good people and fine organizations out there that are doing their best. Let’s take stock of the progress that has been made in caring for a recognizing the needs of pets and other animals when there is an emergency or disaster. These programs were started after the devastating Hurricane Katrina killed hundreds, if not thousands, of pets. In 2006, the Pets Evacuation and Transportation Standards Act (PETS) was put in place. The Act ensures that FEMA will always have an evacuation plan in place whenever they respond to an emergency that affects pets or other animals. They make every effort possible to get pets out of evacuation zones safely and eventually reunite them with their families. Humane Societies and Animal Shelters now plan in advance as much as possible. Long before a hurricane touches land, they are working days ahead to place their current animals with other animal shelters or humane societies outside of the range of the hurricane or any other natural disaster. This frees up more space for the inevitable arrival of evacuee pets. Whenever news of natural disasters, animal hoarding or animal cruelty hits the news, people step up to help. This is particularly true when animals have to be relocated to other facilities. Animal lovers will drive and even fly hundreds of miles to adopt pets who have to be relocated in the face of a disaster. When various rescue groups work with each other and with state and local emergency organizations, it’s the evacuees and their pets who benefit. Among the agencies that are currently working together to make sure animals are being rescued and cared for properly are FEMA, USDA Animal Care Emergency Programs, Humane Societies, the ASPCA and county, state and federal emergency relief organizations. Many pet food and pet supply companies now donate truckloads of food, litter, crates and medicines to the organizations caring for displaced pets. Like many of the emergency and rescue groups, they learned a powerful lesson from Hurricane Katrina – people will not abandon their pets. In fact, people will often forgo food for themselves in order to feed their dog or cat. With corporate donations rolling in, evacuees won’t have to worry as much about feeding their pets. After Katrina, many people stayed in their homes because evacuee centers and shelters turned them away if they had their pets with them. Disaster animal rescue programs simply weren’t in place to handle the countless pets of Louisiana’s hurricane survivors. Families who were turned away at shelters because of their pets tried to check into hotels and were told that they couldn’t keep their dogs or cats with them. Many people stayed put in their homes rather than face abandoning their pets to the elements. Far fewer people stayed behind in the path of hurricanes this year, which probably saved a great many lives. Because shelters and hotels opened their doors to pets, families didn’t have to stay behind in the path of a hurricane or perish themselves trying to stay behind to care for their pets. Because agencies worked closely together, supplies were utilized more efficiently and the lines of communication kept information flowing. The animal community, government agencies and rescue organizations have all made progress toward a better way to handle the evacuation of families with their pets over the last several years. More families with pets are being either kept together or successfully reunited in the aftermath of disasters. It is a giant step in the right direction, but the goal must be that not one animal is left behind or lost. We are getting there; but we haven’t arrived yet. Let’s continue the good work! *Photo courtesy of FEMA website. What is FEMA? I assume it is a USA federal body? 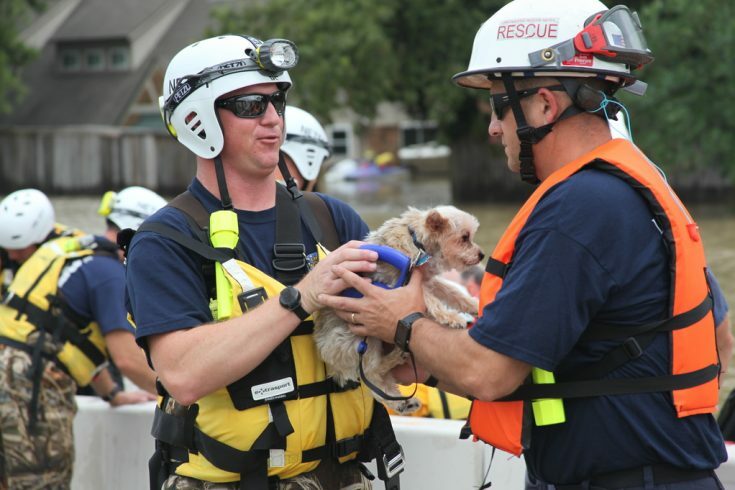 I can see on the news that I notice more people bringing and rescuing animals than in Katrina hurricane. I could tell people learned from the last disaster, just as you pointed out in your post. I heard on NPR that saving pets saves people. Too many people refused to evacuate from Hurricane Katrina because they wouldn’t leave their pets. I know that would be me. Many people died from that disaster because they stayed to be with their pets. That was the main reason FEMA changed their policy. A GREAT change.